I am reading the E edItion of this book. What a great book. I stopped attending organized religion services about 4 years ago. I am now Free. This book explains so much about scriptures that have been misinterpreted by pastors and other leaders. I am nearing the end of the book and don’t want it to end. Michael has done a marvelous job! I hope he publishes another book soon. I highly recommend it. Hi Carol. 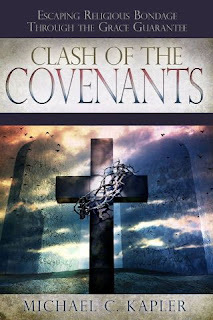 I'm really glad you enjoyed my book (Clash of the Covenants). Your comments are a perfect example of why it was written. No pressure, but what you wrote here would make an excellent 5 star review on the book's Amazon page, if you feel prompted to do so. But regardless, I want to thank you for sharing your response with us, and I hope you'll recommend it to others who need to hear the good news in the proper context. Hello Michael. I recently did this review on Amazon. They would not post it because Amazon said it doesn’t stick to their guidelines. I revised it.....and don’t know if they will post the revision or not. They did not state what guideline it did not meet. Thanks Carol. I see your review, but I find it strange the original wasn't accepted based upon what you wrote here. It seems to match with what others have said. But I do appreciate you taking time to do that!